The 18-hole Del Mar Country Club in Rancho Santa Fe, CA is a private golf course that opened in 1991. Designed by Joe Lee, Del Mar Country Club measures 7226 yards from the longest tees and has a slope rating of 142 and a 75. The 18-hole East/South at Morgan Run Club & Resort in Rancho Santa Fe, CA is a resort golf course that opened in 1973. Designed by Harry Rainville, East/South at Morgan Run Club & Resort measures 6553 yards from the longest tees and has a slope rating of 126 and a 71. The 18-hole Lakes/Ocean at Fairbanks Ranch Country Club in Rancho Santa Fe, CA is a private golf course that opened in 2004. Lakes/Ocean at Fairbanks Ranch Country Club measures 7081 yards from the longest tees and has a slope rating of 128 and a 74. 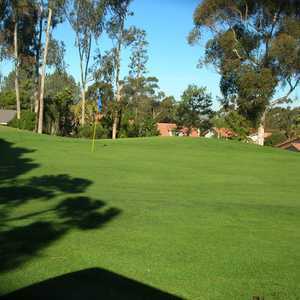 The 18-hole North/East at Morgan Run Club & Resort in Rancho Santa Fe, CA is a resort golf course that opened in 1973. Designed by Harry Rainville, North/East at Morgan Run Club & Resort measures 6286 yards from the longest tees and has a slope rating of 123 and a 70. The 18-hole Ocean/Valley at Fairbanks Ranch Country Club in Rancho Santa Fe, CA is a private golf course that opened in 2004. Ocean/Valley at Fairbanks Ranch Country Club measures 7089 yards from the longest tees and has a slope rating of 133 and a 74. The 18-hole Rancho Santa Fe Golf Club in Rancho Santa Fe, CA is a private golf course that opened in 1928. Designed by Max Behr, Rancho Santa Fe Golf Club measures 6940 yards from the longest tees. 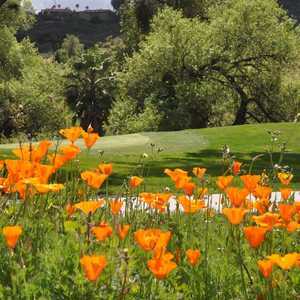 The 18-hole South/North at Morgan Run Club & Resort in Rancho Santa Fe, CA is a resort golf course that opened in 1965. Designed by Jay Morrish, South/North at Morgan Run Club & Resort measures 6493 yards from the longest tees and has a slope rating of 125 and a 71 USGA rating. The 18-hole The Bridges At Rancho Santa Fe in Rancho Santa Fe, CA is a private golf course that opened in 1999. The Bridges At Rancho Santa Fe measures 6901 yards from the longest tees and has a slope rating of 145 and a 74 USGA rating. The 18-hole The Farms Golf Club in Rancho Santa Fe, CA is a private golf course that opened in 1988. Designed by Perry Dye and Pete Dye, The Farms Golf Club measures 6947 yards from the longest tees and has a slope rating of 142 and a 73. The 18-hole Valley/Lakes at Fairbanks Ranch Country Club in Rancho Santa Fe, CA is a private golf course that opened in 1984. Designed by Ted Robinson, Sr. , Valley/Lakes at Fairbanks Ranch Country Club measures 7196 yards from the longest tees and has a slope rating of 131 and a 74.